Cortona is located in eastern Tuscany, near to the border of Umbria and only 20 minutes from Lake Trasimeno. Cortona is situated on a hill (500 metres above sea level), where you can enjoy a unique and amazing view of the Val di Chiana. We can definitely consider Cortona as a strategic base from where to explore Tuscany and Umbria, and where you should spend at least a couple of days as part of your itinerary. Its location, near to Montepulciano (32 Km), Pienza (45 Km), Arezzo (28 km), Siena (72 km), Orvieto (95Km), San Gimignano (117 km) | and Umbria; Lake Trasimeno (15 Km), Perugia (45 km), Assisi (70 km) and Orvieto (96 km) makes it the perfect base from which to explore some of the most impressive sights and attractions of history and from where famous personalities have become successful in the world. Cortona founded by the Etruscans (Original name “Curtun”) still retains many of its original remains from the Etruscan period, also Cortona encloses diferents story from characters that boasts great Renaissance artists, such as Luca Signorelli and Beato Angelico, as well as Pietro di Cortona from the Baroque period. Cortona is full of many good restaurants and bars that serve, mainly, typical dishes of Tuscany, and there are also many excellent restaurants outside the walls of Cortona. Cortona is also full of wine bars where you can dine accompanied by a good Tuscan wine, or wines, or simply buy local products. The cheese Brillo in Piazza Signorelli and Enoteria, in Via Nazionale, are great places for wine tasting. If you prefer to make your dinner, there is a small supermarket called Molesini in the main square of Cortona (Piazza della Republica), while for those of you with a sweet tooth, there is a food market in Piazza Signorelli. The most important festival in Cortona, from a gastronomic point of view, is the “Sagra della Bistecca” (steak Festival) which takes place on the 14th, 15th and 16th August of each year. “Under the Tuscan Sun,” Frances Mayes’ heart warming true story, and the popular film it inspired, has brought millions of tourists to Cortona. A very humble working man’s town became an international destination. Was Cortona perhaps better in it’s quieter days, an historical Etruscan hilltop town, less discovered by those of us looking for some illusive magic of our own? I will never know. However, I can say quite confidently, having visited dozens of walled towns in Tuscany and Umbria, that Cortona is perhaps the most magical and real. Each town is different, special, inviting, but I could live in Cortona for a while or perhaps for a lifetime. There is a vast openness, even inside the walled fortress. One moment you may find yourself walking down a winding narrow path with flowered terraces and full clotheslines on either side, and then your world opens up and you can see for miles in every direction. Colours that paint the landscape of an infinite imagination. You may see the same person having his second cafe on the corner each morning, or you may watch a new group of aspiring artists from American and Canadian Universities display their work proudly in the centre of town. Walk into the local bar, sit under a piece of exquisite modern art and have a fabulous cocktail, or have lunch in a family owned restaurant where you can feel the heat of mamma’s stove waft past your table. Visit enchanting churches and important museums or find a one of a kind piece of hand made jewellery imprinted with the ancient Etruscan language. Watch an outdoor ballet that rivals the best of Manhatten, or sip a glass of fabulous local Syrah. Cortona, in my estimation, can maintain it’s medieval allure, it’s Etruscan heritage, it’s Tuscan charm no matter how many buses approach it’s walls or how many couples walk the path to Bramasole. The marvel that is Cortona, fabulously lost in time, dynamically alive in the moment, will prevail in the fortitude, patience and integrity of her people. WHEN IS IT BEST TIME TO VISIT CORTONA? We suggest to visit Cortona from Spring to Autumn when Cortona wakes from the hibernation. Between May and June it has the highest flow of tourists, when in July and August the flow is little more calm to turn intence again in Autumn till the end of October. Around middle of November Cortona is ready to go back in to the hibernation time, so If you planning to visit Cortona in the Winter we suggest you to do during the Festivity (bank holidays). It is very nice to be in town during the Christmas and Easter time when some extra markets are set up on the main square. 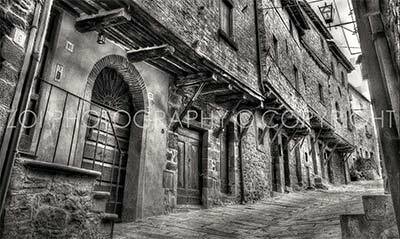 In those shoulder months Cortona is quite but still interesting and some interesting activities to do. It is best to avoid the months of January and February, when most of the hotels, restaurants and shops remain closed, unless you are looking to experience an unusual calm and a trip focused on meditation and reconciliation of your spirit, in that case be ready to be in the middle of a very calm.